Today, I would like to discuss some additional reversal patterns that will add to our knowledge of candlestick chart basics in Japanese candlestick patterns. The Shooting Star is a BULLISH trend reversal pattern, meaning this pattern will be found at the bottom of a down or bearish trend. It is associated with a trend reversal from a short trend to a long trend or Bearish to Bullish. In the diagram above, you will notice that it has a small body at the bottom of the candle and a longer wick or shadow on the top of the candle with no lower wick or shadow beneath the candle body. The long upper wick or shadow indicates the bull’s inability to close higher and the bear’s rejection of the bullish trend. It is not important to the shooting star whether it is an actual bull candle or bear candle, either one tells the same story. This pattern indicates in a downtrend the loss of momentum to the down side and, perhaps, a potential reversal to the upside. The Hammer Candlestick pattern is a BEARISH trend reversal pattern, which is the opposite of the Shooting Star. As illustrated in the picture above, the shooting star has a small body on the top of the candlestick and a longer wick on the bottom of the candlestick. It indicates a potential reversal in a bearish down trending market to a bullish uptrend. The long shadow indicated the bear’s inability to close lower and the bull’s rejection of the bearish trend. Also, as with the shooting star pattern, it does not matter if the actual candle is a bearish or bullish candle, it is the wick and body relationship that is important. The Evening Star pattern is a bearish reversal pattern consisting of 3 bars in an up-trending market. As illustrated in the picture above, the first candle is a long-bodied, bullish candle extending the current uptrend. The second candle is a short, middle candle that gapped up in the open. 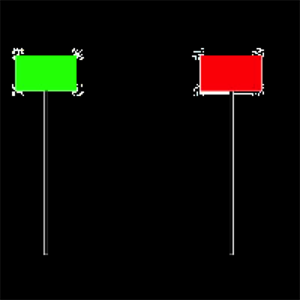 The third candle is a bearish, long-bodied candle that gapped down on the open and closed below the midpoint of the body of the first candle. If the pattern is found in a strong uptrend, it may be a very good indication of severe weakening of the uptrend and potential reversal. The Morning Star is the opposite of the Evening Star and is a Bullish reversal pattern, which occurs at the bottom of a market. 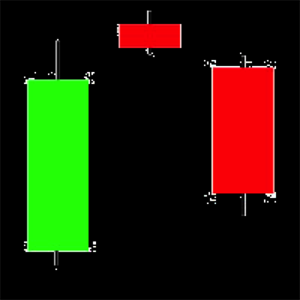 As illustrated above, the pattern consists of three candlesticks in a down trending market. 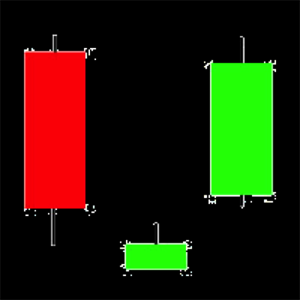 The first candle is a long-bodied, bearish candle extending the current downtrend, the second candle is a short, middle candle that gapped down on the open, and the third candle is a bullish, long-bodied candle that gapped up on the open and closed above the midpoint of the body of the first candle. 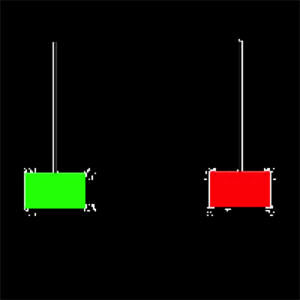 These 4 candlestick patterns are very good indicators of a change in market sentiment and, if they are present at either the tops or bottoms of the market, they indicate a very good possibility of a change in momentum in the market. Look for these patterns and identify any possible reversals in the charts that you follow. As always – Good Trading!